Propolis is a fragrant and glue-like substance that is made by honeybees from resin, waxes, and their own secretions to construct their beehives. Assyrians used it as a balm to treat wounds and ingested it to get rid of tumors, while Greeks treated abscesses with it and Egyptians healed cuts and minor bruises with it, aside from using it to embalm their dead. Propolis’ composition can differ based on where the bees are located and what flowers and trees they visit. The chemical compounds of propolis found in Europe would be entirely different from the propolis harvested in Brazil. However, even though the potency of chemical compounds in propolis vary in different geographic locations, their medicinal benefits remain the same. Propolis can be taken into the body via two methods: one is via topical form, which includes ointments, lotions, and creams; another is via oral ingestation, which includes capsule, liquid extract, or tablet form. Propolis is packed with antibacterial, antifungal, anti-inflammatory, antiseptic, and antiviral properties. For instance, people who had been victims of traumatic burns can find themselves recuperating faster when they ingest propolis, for it can speed up the regeneration of new cells. A topical propolis alcohol extract is also more capable of reducing mast cells in oral surgery wounds than steroid cream. Ointments that are made up of three percent propolis, like Coldsore-FX or Herstat can help sores or cold sores from genital herpes heal faster. Furthermore, a 2012 study in Brazil concluded that propolis can inhibit the growth of Candida albicans, a fungus that is characterized by yeast overgrowth. Propolis also has anti-cancerous properties. These properties make it possible for propolis to stop cancerous cells from multiplying; lessen the risk that cells will become cancerous; and hinder cancer cells from signaling to each other. One study showed that Chinese propolis can be effective in treating breast cancer as it has anti-tumor effects on breast cancer cells. Caffeic acid phenethyl ester, a compound that is found in propolis, is good at suppressing inflammatory compounds that contribute to causing bone diseases like osteoporosis. Propolis can also delay the onset of inflammation-related diseases such as Alzheimers, arthritis, and heart disease. Propolis can also help treat food poisoning. It hinders the growth of C. jejuni, Enterobacter faecalis, and Staphylococcus naureus, which are three bacteria found in most food poisoning cases. Propolis is an anti-resorptive agent and can do wonders for your dental health. This means that when you find your two upper teeth gone after you knocked them out against the wall when you slipped on a banana peel, you can enjoy the fact that taking propolis can help control the inflammation of your gums so that dentists can put back your teeth where they came from. Propolis can be used to ease sore throats. It can also be used to kill colds and the flu and can combat the negative effects of seasonal allergies. If you want to get rid of your warts and acne, you should take propolis. It was mentioned earlier that ancient Egyptians used it to treat wounds; they also used it to gain skin health, as evidenced by Queen Cleopatra’s beautiful complexion. Propolis can help skin conditions while at the same time speed up cell growth and decongest pores. Propolis can help treat ear infections. In fact, an Italian study that was conducted on 122 children between the ages of one and five who all had recurring ear infections showed that using propolis and zinc solution helped treat them, along with using antibiotics. Try this Ukrainian honey cake recipe for you and your friends’ enjoyment. 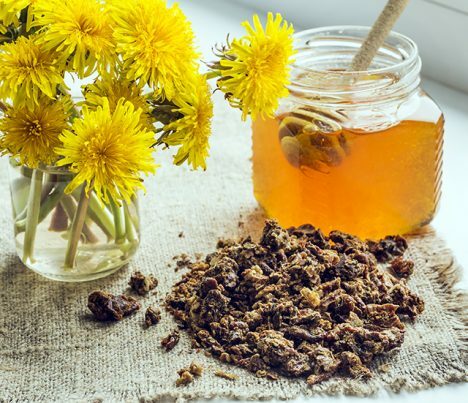 Propolis can be used to ease sore throats. Propolis can help treat food poisoning. Propolis is an anti-resorptive agent and can do wonders for your dental health. If you want to get rid of your warts and acne, you should take propolis. Propolis can help treat ear infections.